As the mother of two grooms with recent weddings and rehearsal dinners under my belt, it dawned on me just the other day, how much knowledge I gained and how many lessons I learned as 1) the Mother of the Groom and 2) the floral designer for some elements of each wedding. Both weddings were destination weddings, so I learned first hand about long distance coordinating and the logistics for designing flowers for an out-of-town wedding. I learned great lessons in terms of managing stress and being completely "in the moment" for both of those weddings. We worked with wonderfully experienced planners in Palm Beach, Fl and Charleston, SC, and learned so much! As I was meeting with a couple the other day, I was sharing lots of tips and advice that had nothing to do with florals, but everything to do with having a wonderful, magical wedding weekend! One tip had to do with the responsibilities of the Best Man to ensure that the wedding goes along with no hitches, and if there are hitches, you the bride and groom know nothing about it - it was handled! I find myself talking to brides and moms about the realities of lots of DIY. I can't tell you how many moms call, last minute, to have me do some things they thought they could do. It's really important to realistically think these things through and to discuss them out loud with someone with experience, who can estimate the time investment. I learned first hand. In my career before I became a wedding floral designer, I managed lots of large projects and events with detailed timelines and budgets. I was the leader and mentor of a lot of people and taught them the importance of planning and organization, the importance of relationship building and establishing trust with those with whom they worked. I knew that the skills and knowledge that I learned were priceless to me in lots of ways, but it just dawned on me how much of that knowledge I share with my clients just in conversation. Some of my clients have some family weddings under their belt, but for many this is the first wedding that they have planned and they seem to "soak up" the information that I share. I've seen them even take notes. I'm so glad that I came to this career at the time I did! Life experiences are invaluable, and I'm so glad that I bring lessons learned to my clients! Speaking of words of wisdom, I just read an article that listed a few "must haves" for your wedding and I thought I would share them. 3) Pregnancy Nausea Lozenges tucked into your get ready bag. They work quickly to settle a nervous stomach! This year has been what I guess I would call a breakout year for Jane Guerin, flowers. We are on track to do about 70 weddings this year. Whoop!!! That's is a lot of weddings, so now there are 5 of us who love, love, love doing wedding flowers. We have as much fun getting to know our brides as we do designing their flowers. In our effort to create a sustainable world, we are not only sourcing flowers grown in the US as well as local flowers, but we are growing some flowers as well. (NOT on the scale of some flower farmers who do that for a living, but we grow just enough to have for some of our weddings of brides who like that natural look and feel that is so trending now.) Of course, we forage to create that "gardeny" loose natural feel, and we do some "civic" pruning. (With permission, of course.) Do we still have to buy imported flowers? Yes. But seriously, we make a conscious effort to buy from US growers and Virginia growers as much as possible! This year I have collaborated with an old customer turned friend, and bought lots of her peonies. For just one wedding, we held over 100 stems in the cooler for 3 weeks so we could bring these gorgeous, and I mean gorgeous flowers to our brides! We have big plans for next year as well. We see no signs of slowing down! This has been our first year that we have had to turn down what seems like a lot of weddings to me. If you like our work and philosophy, and you would like for Jane Guerin, flowers to do your wedding flowers, please contact us sooner rather than later to be sure we can work with you. Well, I hope that this is the last snow for many months! I'm sitting here trying to catch up on some work, i.e. Blog posts and contacting photographers for pictures. I had the pleasure of meeting Laura Gordon of Laura Gordon Photography this year. She was the photographer for two of my weddings. After I met her, I visited her web site and was so impressed with her work. Her photographs are so artistic. I'm thrilled that I have some of her work to feature on my web site. Here are just a few of her images. My bride wanted all orchids! So elegant! The bride loved baby's breath and wanted it incorporated in all of the bouquets. It seems I have been doing weddings non-stop since March of this year. This includes the Rehearsal Dinner and Church and Reception flowers for my son, Hunter and daughter-in-law, Katie's wedding in Edisto Island, SC in April. All of my weddings have been special in their own way, especially Hunter and Katie's wedding. I love the story about how they picked the location for their wedding. Katie's family has been going to Edisto Island for a summer vacation every year since Katie's mother was 4 years old. Katie's grandfather was a physician, and they tell me that he looked forward to this vacation more than any other trip or vacation spot anywhere. This tradition continues, and it is a special time and place for Katie's family....grandmom, grand aunt, aunts, uncles, cousins, spouses, boyfriends, fiances, and grandchildren. They are from Columbia, SC and lots of their friends have houses on the Island, so many of the friends join the party. When the time came to pick a location for the wedding, both Katie and Hunter knew they wanted to get married in Edisto Island. Loved these wonderful photos by Charleston photographers Sean Money + Elizabeth Fay. Katie's bridal portrait and bouquet that I made at about 6 am in a cottage on Edisto Island. We transported it to Charleston in a huge Gatorade cooler with ice packs around it! Mr. and Mrs. William Hunter Guerin! Yay!!!! Katie looked gorgeous in her Claire Pettibone dress, and Hunter looked so handsome with his Brackish Bow tie made with guinea feathers. Katie's cousin is the creator/owner of Brackish Bow Ties. I brought the cherry blossoms from DC. The French tulips were from California and they were 30 plus inches tall!!! In this picture is one of Katie's precious sisters on the left and Hunter's older brother Hammond to his right. 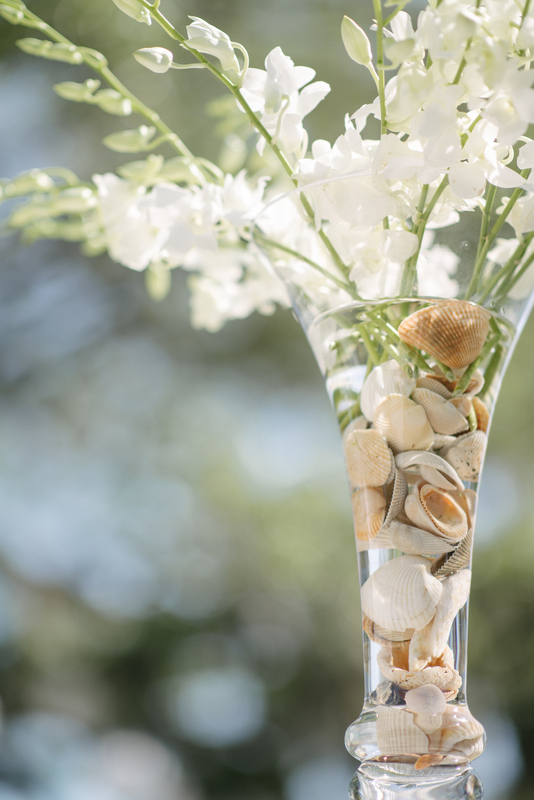 I collected the shells off the beach for the tall arrangements. I used tons of white dendrobium orchids at the Rehearsal Dinner, then added tons more for the reception. The reception was the BEST party!!!!! The band from Atlanta, Bobby and the Aristocats was absolutely fabulous!!!!!! We could not be happier that our wonderful son found Katie, who is just so very special! Have an extraordinarily happy and healthy married life Huntbe and Katie!!!!!!!! We love you so much!!!! I am loving my new additional space, which is dedicated to consultations only. At least at this point, it's dedicated to consultations leaving the other side of my space for design work, storing flowers in cooler, supplies, etc. It's wonderful! I've had 4 meetings in the new space, even though we are still moving things in and spiffing it up. Just a little history about my building....it was built in 1826 as a physician's office. It is two separate spaces divided by a wall in the center with a door for passing through. It's really charming, and I love that it has stood the test of time, so far. Just think, it was standing during the Civil War, which raged in Fredericksburg! It is so solid, I know it's going to be around for a long time. It's been a physician's office (back in the day) a lawyer's office and an architect and accountant's office. Now it houses Jane Guerin, flowers! Boy if those walls could talk! Take a look at my black accent wall. Everything else is white/neutral! Both of these cabinets were hand made by a fellow who sells his furniture in antique markets across the country. I got them in Atlanta. The doors are old windows. I love things with a story.....I'm Southern. what can I say? I'll post pictures when we finish! Until then, I'm just enjoying not falling all over other designers or helpers in the shop! Yay!!! Well, not an arrangement, but just very relevant on this snowy day! Love this moody arrangement and lighting. My backyard! Oh, I can't wait until spring....made some changes!!! Always!!! As my great friend in Birmingham (photographer for Southern Living) said, "Our plants have wheels on them!" Mine too!!!! Always moving things around!! Ahhhh! This is getting me through this second round of snow. Even though it's still snowing outside, at this point, it's ok! Flowers do that for me!!!!! I just have to say that it drives me crazy that Christmas decorations go up before Thanksgiving. I know, I know, I've been in retail, and I know that 85% of a retail business' income is made from Christmas sales, so I understand it. But, I don't like it. I like (try) to be there, in the moment, and enjoy each season and each holiday! I love to experience Advent before Christmas, and while I'm talking about the church calendar, I love to experience Lent before Easter. To experience the weeks before Christmas and Easter make the celebrations more special and meaningful to me. But back to Thanksgiving! What a great time for family and friends to get together and enjoy each other, and, not to mention, enjoy great food. How fun is it to get out those wonderful recipes from Thanksgivings gone before. Everytime I pull out the "Green Bean Casserole" recipe that I wrote on a notepad in my sister's kitchen years ago, I just feel happy. It's great to remember great times!!! So next Thursday, let's all count our blessings and be thankful for all that we have, love our family, enjoy great food, remember those we have shared those dishes with over the years and who are no longer with us, and just take a break from our hectic "connected" world. It has been a whirlwind of activity at Jane Guerin, flowers! Weddings, weddings and more weddings, parties, fund raisers, baby showers, physician office openings, and planning for Christmas events and weddings! Yikes!! But I am loving it all. However, don't think that some nights at 11 pm or so, I haven't asked, should I do so many weddings, when can I follow up with photographers for pictures, when can I blog, where can I find an apprentice that loves this work and GETS me, when can I redo my web site, etc. Thankfully, I have a business manager so now the bills get paid on time!!! Oh well, I just wanted to direct you to my Jane Guerin, flowers FB page so you can check out some of the new photos. I did have a little bit of a break on Saturday, Nov.2 to attend the UVA vs Clemson game. My oldest son graduated from UVA and my youngest son graduated from Clemson. This game is tough for me. I wear something orange and I clap for every good play of the game by BOTH teams. Check out our tailgate and our get together after the game at my son and daughter-in-law's house to celebrate our youngest son Hunter's Halloween birthday! That cake/pie was chocolate and peanut butter....imagine a Reese's peanut butter cup on steroids!!!!! Hunter's nickname is Huntbe! Our baby sitter created that nickname when Hunter was very young! Now, off to start cooking and decorating for Thanksgiving while getting ready for December weddings and writing proposals for 2014 weddings!! I am THANKFUL! I have 2 wonderful doggies in my life! One is my 5 lb. Yorkie named Chloe. The other is my son and daughter-in-law's 100 lb. white Lab, Sawyer. They both make me so happy!!! Sawyer is the happiest, sweetest, smartest dog you'll ever meet. He has a bark that would scare any boogieman away, but he is sweeter than sweet! He loves to dive off the dock into the lake when he comes to visit! Chloe hates the lake, and she just stands at waters edge and barks her head off at Sawyer the entire time. I think she is worried about him. She just can't believe anyone would want to go into the water, ever!!!! They are truly like mutt and jeff, but they love each other to pieces! I absolutely love what I do. I love getting to meet with brides-to-be and, lots of times, the mother of the bride and/or the mother of the groom. It's so much fun to discover the vision for a wedding, and then execute that vision. No matter what the vision, my goal is to achieve it in an interesting and elegant fashion - underscore interesting - underscore elegant! I like to include texture, and I love to combine interesting color combinations....even my all white bouquets are not all one white! A wedding this weekend was inspired by nature. The bride lives in San Francisco, so no wonder. (I've never seen such gorgeous and bountiful flowers as those in the San Francisco Brannon Street Flower Market....yes I visited it at 5 am while on vacation!!!) Oh, I purchased the peach colored silk ribbon on the bouquet from France! Move over Midori!!!! Not really - I still adore Midori! This bride had me when she told me her dress was peach! She and I had fun!!!!! Oh, it was an outdoor wedding (wildflowers laid end to end on each side of the isle) and the rain absolutely stopped in time for the ceremony and began again when the ceremony was over and all were safe inside at the reception! FABULOUS wedding! Let's do it again, Katie! I just cannot believe it's September already! School's back in session, Labor Day is over, I just celebrated my September 8th, wedding anniversary, and it is time for those fall weddings that seemed so far away when we were designing the proposals. I am so ready for the fall crush!!!! (Starfish for a beach themed reception are in, birch logs are in.....I'm ready!) I cannot wait to get my hands on a "boatload" of flowers this Wednesday and Thursday!!!!! I'll try to be better about posting pictures. In the meantime, enjoy these late summer sunflowers! Wow! What a genius!!!!!! I was totally inspired by Christian Tortu who taught a class at FlowerSchool New York. The class was titled "Impressionist Flowers from Giverney" and we created a bouquet that truly looked like an impressionist painting! Oh how I loved the soft palate! Christian Tortu was born in France's Anjou regions to parents who were truck farmers. In fact, his family has been producing crops for market for generations. He credits his native countryside for his inspiration. He has designed flowers for the great fashion houses of Dior and Chanel as well as for the Cannes Film Festival. His latest book, Sensational Bouquets, is so gorgeous...his arrangements are examples of how he bends the rules of traditional flower arranging to design fabulous and thoroughly contemporary bouquets. He has shops in Paris and Tokyo, and I mean gorgeous shops!!! I continue to be inspired by so many Master Floral Designers at FlowerSchool New York! As one of my fellow classmates and floral designer from Philadelphia and I discussed, studying with these different designers helps us grow by challenging us to stretch beyond what is just comfortable, increases our design sensibilities, and keeps us relelvant in this world of many styles of floral design!!! Here we are!!!! What a talented man...just genius!!!! Loved the class! Wow! Aren't we lucky to live in this country?!? I just wanted to take this moment to wish everyone a very Happy 4th of July!!! I'm just so excited! My oldest son, Hammond and his wife, Robyn are expecting their first baby in December. I am just counting the days! I cannot wait to start shopping for Baby Guerin. I told my husband that I will not be cooking this Christmas. I'll be holding that precious baby. I'm also so excited because my youngest son, Hunter just proposed to Katie, his girlfriend of 4 years. Hunter planned a whirlwind weekend, after planning a fabulous proposal at the National Arboretum in DC. He designed the most gorgeous ring that is so Katie. He knew several features that Katie wanted, but put his on twist on it as well. Hunter is a mechanical engineer so he was definitely involved in the design! It was so sweet, I just can't tell you. Here we are celebrating at Palladio Restaurant at Barboursville Vineyard. This is a great, great time for the Guerins! One of the weddings I did last fall has been featured in the wedding blog, Heart and Love Weddings. I am just so happy to share this post. I knew the bride, Amy, was very happy with her flowers, but I just didn't know she was "over the top" happy until she sent me the feature to read. I remember meeting with Amy, and taking copious notes, but apparently I missed something. I remember putting together a proposal, which I thought totally captured her vision, sending it to her and pretty soon after, getting a call from her. She told me we had a disconnect somewhere and proceeded to restate her vision and desires for her flowers. She did it in a positive way, and I think you see the results of that collaboration. It truly is a collaboration in which both the bride and the floral designer have the very same goal - gorgeous flowers on wedding day! I think Amy knew that! She is a special girl!!! I really, really do feel very close to my brides by the time of the wedding (usually by the end of the first consultation). There is just this strong connection that I feel, which is very hard to define. I guess it has to do with being a part of one of the most special days in a bride's life. My goal for each and every bride, is to execute the bride's vision in a beautiful and elegant style, with a huge emphasis on "elegant". Enjoy the spectacular photography of the very talented Carly Rehberg. I had so much fun with these flowers for this party. It was a party featuring the celebrated Richmond artist, Sunny Goode. Her work is fabulous!!! I loved, loved, loved it! And she is just lovely!!!! My client gave me pretty much a blank slate for this party. She did give me the invitation showing me the color scheme, which really complemented the artist's work! She gave me some FABULOUS containers, and I used some of mine as well. She also told me she wanted designs that were more current and fun...... JUST MY CUP OF TEA!!!!! So here are the designs I created. Loved these vibernum from LynnVale Studio!! I love locally sourced flowers as well as my food!!! I captured the design in the vase with the flowers!! I did love this!! Isn't this epergne the most gorgeous thing you have ever seen? So, historically they were use primarily to display fruit as well as flowers. So, I decided to use both in an effort to present a current look and stay true to history and tradition. You can't see the purple baby artichokes, but they were great. I also put the artichokes, key limes, and kumquats in the arrangement to tie it together, but I didn't capture them in this shot. This design was for a table on the deck! The weather happened to be fabuous! How fun and cute is this? I hope you enjoyed this post as much as I enjoyed designing the flowers for this party! If you love Sunny Goode's work as much as I do, visit her web site at www.sunnygoode.com! Those who know me are well aware of my extreme admiration for Ariella Chezar. Ariella is an internationally known floral designer who lives in New York. Her style is so elegant and lush it is no wonder she is so highly sought after. This was my second class with Ariella, and it didn't disappoint. We met at a Starbucks and then walked to the flower market on 28th Street where Ariella talked about how she selected flowers and created her color palette. After swooning over those gorgeous flowers, we then walked to two ribbon and trim companies located in the Garment District. I had been to both, but it was a treat to be there with Ariella showing us which ribbons she would use in her design work. The ribbons that blew me away were the vintage ribbons, most of which were made in France, and those that once they are gone, that ribbon is "no more" as Ariella said. After our tour of the Flower Market and the ribbon and trim shops, we took taxis back to FlowerSchool New York and were treated to a delicious lunch. After lunch, Ariella demonstrated her style of creating a bridal bouquet. We all asked tons of questions, which she welcomed. I don't think I've ever been as inspired as I was after that class. Ariella was fantastic, and all the women participating in the class were all so passionate about this business/art that I left there on a huge high!!!! It was a GREAT day! Have you ever seen such beautiful tulips? I am one of the luckiest women in the world! I reinvented myself 6 years ago, and I have never been so passionate about my work! So, never ever think you are ready to stop growing! You just never know what joy is around the corner. I read recently that success is where passion, talent, and the market intersect! I think I found that sweet place! Happy Valentine's Day from Jane at Jane Guerin, flowers. These were the "expressions of love" that left my shop today! Believe me when I say they were made with love as well!!!!! Wow! How did it get to be January 10, 2013 so fast? Where did the time go? I guess when you are busy at work and you add Christmas cooking, shopping, decorating, Christmas parties, decorating at church, and other such things, the time just gets away from you. And, before you know it, it's New Years and you are still cooking, going to parties, undecorating at home and at church, and celebrating with friends. Amidst all this "busyness", I've been meeting with brides for their upcoming spring and summer weddings, developing proposals, planning bridal show exhibits, planning Easter flowers and a workshop for St. George's Flower Guild, and working on the expansion of my business to include coordinating event decor. So, that's how it got to be January 10, 2013!!!!! Expansion of my business from providing just floral decor to include providing event decor, is just so exciting! I've been resourcing the best linens, china, chairs, customized printing sources, and other resources for unique and elegant details to make weddings by Jane Guerin, flowers some of the most memorable events ever. This is so, so fun!!!! But designing flowers is my love, and I've been busy designing. Let me share a few of the events I worked on starting in early December. On the 8th, I had the unbelievable pleasure to design the florals for a Black-Tie retirement party for 5 local physicians. These individuals have had outstanding careers, and the event to send them on to another chapter in their lives was destined to be fabulous. The thought and planning put into this event by the fellow partners and their wives was unbelievable. They asked me to come to the house where the party would be, to help brainstorm and develop a design. One of the first and most fun ideas that I recommended was to put up a "radiology" Christmas tree in black and white in the foyer. I had a vision, but I had no idea what a fantastic job these women would do. The finished tree had white ornaments along with small "xrays" hung by silver hooks all over the tree. They also found silver frame ornaments, which held the practice logo, and were engraved with the physician's name and date. How fabulous is that? All day long while I worked on the florals, the re-enactment of the Battle of Fredericksburg ensued. I watched "Conferderate" and "Union" soldiers walk around town and outside my shop with their rifles on their shoulders. The house where the party took place, was right in the midst of the battle that morning, and soldiers ran through the front and back yards of this house. As the hosts got ready for the party, they watched the "Union" troops put the bridge over the Rappahannock and cross the river to begin the fight. Really!!!! It was a special event and day, and one that I'll remember always. Take a peek at the white flowers. Black Tie/white flowers.....of course! Oh, Foode' catered, and I was told the food was phenominal! The second beautiful event for which I had the honor to provide the flowers was a company Christmas party that was held at the Columbia Firehouse Restauranat in Alexandria, VA. The company is an Engineering firm that designs and manufactures equipment that travels into space on rockets and satellites....lots of smart, lovely people! The employees could not have been more gracious! The Columbia Firehouse restaurant staff were unbelievably helpful to me. They let me in the restaurant early and insisted that they unload all the arrangements for me. The food they told me, was a blend of French and southern........my kind of food. The menu for this party looked out of this world! The room was decorated with a huge fresh Christmas tree with tiny white lights and no other decoration. My arrangements were white with seasonal greenery, "snow tipped" pine cones, and finished with a band of green velvet ribbon. A third event was a staff Christmas party held at, truly, one of the most gorgeous homes in Fredericksburg. I have had the pleasure of designing centerpieces for this party for three years, and I hope to do many more for them. The hosts are just very dear people, and I love having the opportunity to do their Christmas flowers!! The dining room is red, so we usually always use red, but to make it more sophisticated, like the hosts, we add pink to the design. I just love how these arrangements turned out. I just wish I had a camera other than my iPhone to capture the images. Take a peek. I was honored to be asked to design an arrangement for the Open House of the new office for a Fredericksburg physicians' group. The office waiting area is a very open space and reminded me of the space designed by I.M. Pei for the University of Alabama at Birmingham. Of course, the space at UAB was on a much larger scale, but I remember that the space was designed with the patient as the focus. It is Fall, and we wanted the arrangement to reflect the season, but we really wanted the design to reflect the open, contemporary feel of the office. I decided to use lots of curly willow branches for texture, lots (40 stems) of orange/red mokara orchids, and collar this with calathea leaves. I used a very large cylinder and tied green raffia around the top. Take a look! Another contemporary design was inspired by the combination of old and contemporary in one of Fredericsburg's most historic homes. The event was a fund raising cocktail party for Stratford Hall, a beautiful, national treasure. I loved the look!!!! !